Mike Christian was one of the best and most exciting Pro Bodybuilders in the 1980’s. Coming from a tough background, Mike turned his life around when he started bodybuilding at 20 years old. Thanks to his excellent genetics, Mike was able to win the first ten bodybuilding competitions he entered in Oregon. Moving to the Mecca of Bodybuilding a few years later, Mike hooked up with the wild Barbarian Brothers and brought his training to a whole new level. The Barbarian Brothers saw the potential in Mike and proclaimed that he was going win the Mr. America title one day. Mike started competing in the Southern California area and proved his worth against up and coming amateur bodybuilders like Jon Jordan and Bob Paris. He competed at the national level in the AAU and did very well. When the NPC began in 1982, Mike traveled to New York to compete in the first NPC American Bodybuilding Championships. 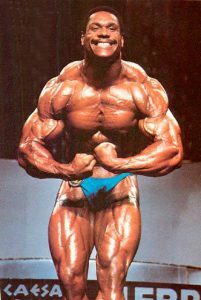 Taking fourth place in the heavyweight class behind Lee Haney, Matt Mendenhall and Bob Paris, Mike knew he was in the mix but he needed to make improvements in order to move up the bodybuilding ladder. In 1983, Mike won the overall at the prestigious NPC California Bodybuilding Championships, establishing himself as a favorite for the NPC Nationals in San Jose, California later in the year. Competing against pre-contest favorites Rory Leidelmeyer and Bob Paris, Mike took a controversial third place and nearly walked off stage in disappointment. By 1983, Mike Christian had introduced a new breed of bodybuilder to the competition scene. Displaying freaky arms, shoulders and back development combined with shredded conditioning, Mike raised the bar on what was possible in a bodybuilding physique. Whether he was showing off his striated triceps onstage or displaying crazy detail in his rear double biceps pose, Mike was one of the first bodybuilders to combine heavyweight muscle mass with lightweight conditioning. In 1984, Mike Christian dominated the amateur bodybuilding scene by winning the overall at the NPC Nationals and then taking first place in the heavyweight class at the IFBB Mr. Universe. Looking even bigger and more impressive than a year earlier, Mike had established himself as one of the biggest threats to the current Mr. Olympia Lee Haney. 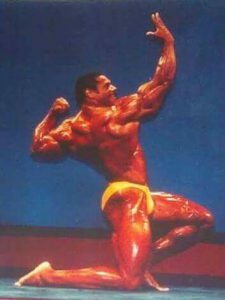 Standing 6’2”, Mike was one of the few big bodybuilders who had the size and structure to challenge Haney for the number one position in the sport. 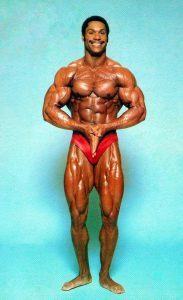 In Part One of my interview with Mike Christian for the Bodybuilding Legends Show, Mike talks about his motivations and emotions as he moved up the ladder in the sport of bodybuilding as well as his rivalries with Lee Haney, Rich Gaspari and Samir Bannout. One of the most charismatic bodybuilders on the scene during the 1980’s, Mike was very popular with the fans and made his mark with both his physique and personality. Check out Part One of the Mike Christian interview to follow his rise in the sport of bodybuilding from his humble beginnings in Oregon to the Mecca of Bodybuilding at Gold’s Gym in Venice, California. Mike talks in detail about his training preparation, his win at the NPC Nationals and IFBB Mr. Universe and his introduction to the professional bodybuilding scene. Featuring rare photos and video from his competitions, the Mike Christian interview will bring back the exciting personalities and bodybuilders from the Golden Era of Bodybuilding during the 1980’s. PreviousPrevious post:The 40th Anniversary of “Pumping Iron”NextNext post:Welcome to the Bodybuilding Legends Show!